Help reach our goal – become a monthly donor by March 31! You'll receive these beautifully painted notecards to thank you for your support! Simply, we cannot keep the lights on, the doors open and the hope alive without your financial support. Every dollar helps. There's a lot written about the Pine Ridge Indian Reservation. But there are many stories never told. Get the facts, and be inspired by our hope. Read about our programs, and discover what makes us different from any other organization in the country. Indeed, there is no place like Red Cloud Indian School. Our students and families are realizing unprecedented levels of success. Read about them now... and cheer us on! On a frigid February morning, Red Cloud graduate Elyssa Sierra Concha ’13 climbed the marble steps of the South Dakota State Capital in Pierre. She wanted to be there early to prepare to testify in support of SB126, newly introduced legislation that would make the three dialects of the Očhéthi Šakówiŋ—Lakota, Nakota, and Dakota—the official indigenous languages of South Dakota. 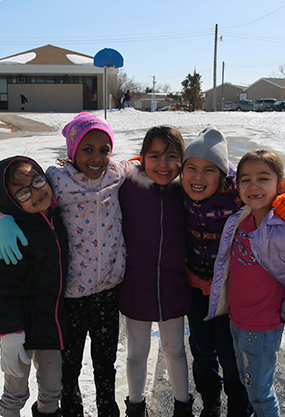 Click HERE to see Education Week's comprehensive piece on Education in Indian Country. HERE is AMERICA Magazine's documentary "Jesuit and Lakota: Graduation at Red Cloud". Click HERE to watch 20/20 special "Hidden America: Children of the Plains". Click HERE to see the Pine Ridge Community Storytelling Project from National Geographic.